These names have a distinguished and refined sound to them. Are you looking for a quaint English baby name for your future English rose or proper English gentleman? English names like Oliver and Amelia have a distinguished and refined sound to them that many parents love. We have also included the names of the most famous English family — the Royal Family — as well as some of our favorite English names from the popular PBS show, Downton Abbey. 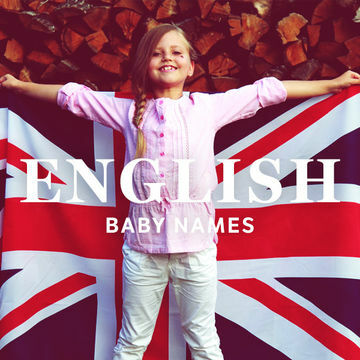 English baby names are a great choice for parents looking for an old-fashioned and quaint name for their baby boy or baby girl. The cute name Maisy is the name that is gaining in popularity the fastest in England and Wales. Other great names include Annabelle, Eliza, Laila, Aisha, Maryam and Lacey. The name Zachary is climbing the charts the fastest, however other great names on the top 100 include Ollie, Jenson, Dexter, Ellis, Jude and Ewan. We love the quaint elegance and old-fashioned sound of names from the Royal Family. The name Elizabeth is one of the most famous royal names, thanks to Queen Elizabeth. Kate Middleton, or her more formal title of Catherine, Duchess of Cambridge, are both beautiful names — or you can go with the name of her sassy sister, Pippa. For boys, you may love the traditional names after Prince Charles, Prince William or Prince Harry. The popular PBS show Downton Abbey is set in pre-war England and follows the aristocratic Crawley family and their servants. For boys, consider the Downton Abbey names Robert, Thomas, William, Joseph and Tom. There are even more cool English names for girls, including Edith, Cora, Daisy, Lavinia, Ethel, Gwen, Sybil, Isobel and Vera. Try saying these names with an English accent to get the full effect!